A couple of days after Thanksgiving and the guilt of gorging is in full swing. I knew this would happen. I try to eat healthfully but there’s always so much good food and drinks at our dinners that the temptation is always too much! I decided to eat whatever I wanted since Thanksgiving is just one day out of the year but limited myself to small portions this time which worked until the drinks were passed around…ok, I passed them around! I didn’t overdo it but still wanted to “balance out” those 4000 calories I probably ate and decided on juicing for a day. I made a spicy vegetable post Thanksgiving cleanse that would be healthy, keep me full and help boost my metabolism. Juicing for a day or two isn’t too difficult if you stay busy and get out of the house, just make sure to bring your juice with you in case you’re tempted to snack. Also, drinking lemon water throughout the day and in-between your vegetable juice helps a great deal. So if you find yourself not keeping to a healthy diet then this vegetable juice is a great way to get back on track. I’ve also added a generous amount of cayenne pepper which studies have shown to help boost metabolism and turmeric. Turmeric has wonderful benefits as well and helps reduce inflammation for healthy joints, and improves the immune system’s disease fighting capabilities. You can’t go wrong with this cleanse! Try it and let me know what you think. Are you juicing? What is your favorite recipe? In a small bowl mix syrup with pepper and turmeric and blend well. Add spiced syrup to juice and stir. Adjust the syrup or honey if you want it sweeter. This recipe was adapted from Aarti Sequeria’s garam masala chocolate gingerbread recipe and changed it around a bit using less chocolate and adding cayenne pepper for more heat. Garam Masala is a spice mixture but it’s not spicy hot like chili. 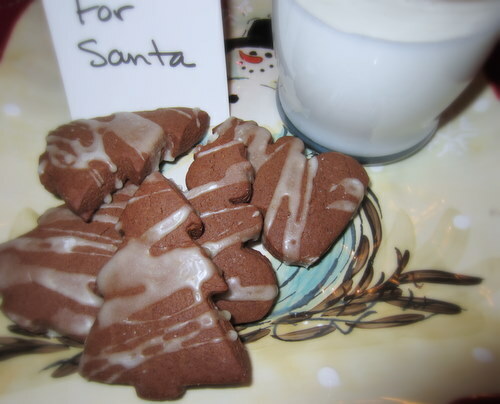 These cookies are spicy, not overly sweet and oh so good with a glass of cold milk. I think even Santa would approve! 1. Mix the first 6 ingredients in a large bowl, set aside. 2. Add butter to a stand mixer and beat on medium speed until smooth. 3. Add the sugar and ginger and continue to beat on medium until light and fluffy. 4. Add the beaten egg until mixed well then slowly add the molasses so it doesn’t splatter. 5. Add the flour mixture slowly until well combined and dough is formed. Dough will be sticky. 6. 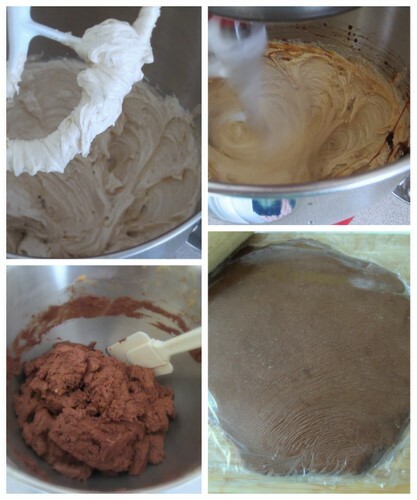 Divide the dough in half and flatten/roll out until 1/4 inch thick. This recipe does not rise much so roll out to your preferred thickness. You can flour a flat surface when rolling out and sprinkle flour on the rolling pin or what I like to do is roll out between 2 pieces of plastic wrap. It’s less messy this way and easily lifted. Refrigerate for a couple hours or overnight. 7. Preheat oven to 350 degrees and line 3-4 cookie sheets with parchment paper. 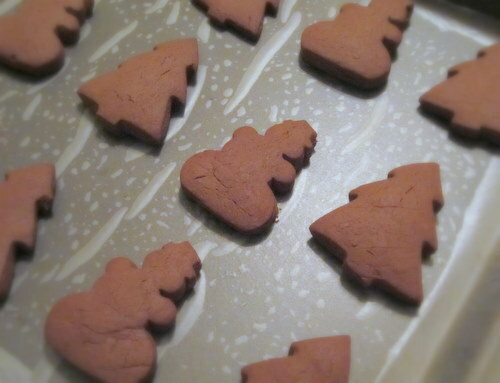 Use whatever cookie cutter shape you have and cut the dough. 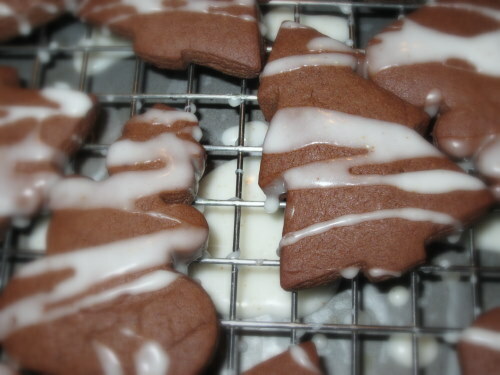 Place the gingerbread on cookie sheet at least 1 inch apart and bake for 10-12 minutes. Baking for 10 minutes will result is softer cookies. Remove from oven and place on cooking rack. Let cool completely before icing. Mix all ingredients well in a bowl until it forms a glaze that can easily be drizzled over the cooled gingerbread.